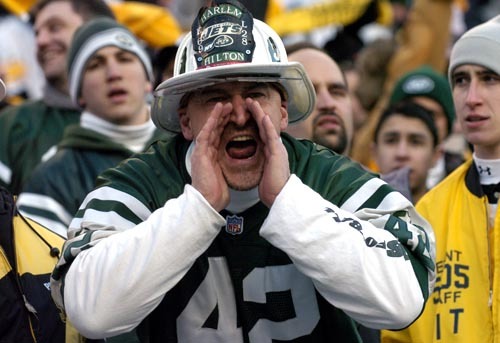 Who’s Afraid of The New York Jets? The NFL season is upon us and so many people are in love with the New York Jets you would think they were the Miami Heat. And like the Heat, everyone seems to want to just hand them this year’s championship. Now, I’m all for being generous and giving to others but not when it comes to titles. Those have to be earned. Just ask LeBron. The Jets have been everywhere this off season. They even competed with Brett Favre for attention and in some cases pushed him aside. Hell, they even have their own TV show on HBO which premiers on August 11th (one day before my birthday, FYI). Of course they still have to actually play the games first. But is should be a pretty good season all the way around. So before the games actually start to count, let’s take a look at some questions the Jets are going to have to answer before they start planning their victory parade. Quarterback: Mark Sanchez still needs to improve over last year. He threw 20 interception and only 12 touchdowns for a 63.0 passer rating. Let’s compare that to the Miami Dolphins’ QB Chad Henne. He also threw 12 TD’s but only 14 INT’s for a rating of 75.2. And Henne didn’t have nearly as many weapons as Sanchez. The Jets have to hope Sanchez doesn’t suffer from a Sophomore Jinx. Defense: As of this writing, Derrelle Revis still is not signed. And I put the blame squarely on head coach Rex Ryan. When you go around telling everyone who will listen how Revis is the best cornerback in the league you cannot be surprised that he now wants to be the highest paid cornerback in the league. Even though the Jets have brought in Antonio Cromartie that is no guarantee that there is not going to be a drop off if Revis sits out part or all of the season. Running Back: They got rid of Thomas Jones who rushed for 1,402 yards, racked up 14 touchdowns and brought in a broken down LaDainian Tomlinson. This is definitely not an upgrade. And judging by the sense of relief from Phillip Rivers and Antonio Gates to Tomlinson’s departure, the Jets may have gotten themselves a bit of a prima donna who has a propensity to get hurt and pout when he doesn’t get the ball as much as he thinks he should. I think that if there is any area where the Jets may have made a mistake its signing Tomlinson. No doubt the Jets are a good team but they still have to make it through the entire season healthy and playing up to their potential. They have a good shot at winning the AFC East and going far in the playoffs, maybe even getting to the Super Bowl. But they’re still going to have to deal with the Baltimore Ravens, the Indianapolis Colts, the San Diego Chargers and a few other teams. I also want to go on record here and say; Watch out for the Miami Dolphins. That’s right; I’m picking the Dolphins as my sleeper team of the season. Don’t be surprised if the Jets are looking up at the Fins at the end of the season.